On Jan. 31, 12 strangers and I met in Paris to catch a connecting flight to Rabat, Morocco. Tired and afraid of what may be ahead, we made cordial introductions as we waited to board the plane. Last semester I had no idea I would be 3,477 miles away from home. I had spent all of August wrapping my head around the fact that I would be graduating a semester early. The thought of graduation alone was scary, and while I did maintain a “seize the day” attitude all through college; I felt I still had more to experience before I entered the workforce. I was not ready to leave. At first, like most 21-year-old girls, I wanted to go to Paris. Looking back today, I’m glad I didn’t. Morocco is a predominantly Muslim country in Northern Africa. There is rich, lively and colorful culture in every city. Being here I have been exposed to its amazing people, food and fashion. My first two months in Morocco consisted of day-to-day lectures with interesting Moroccan activists, journalists and academic scholars. We had the first few weekends to get accustomed to our host families and explore the city of Rabat on our own. When I had finally managed to learn my way through the almost identical streets, our program decided it was time for a change of scenery, and we took off to explore southern Morocco. To date, this was the best week of my life. 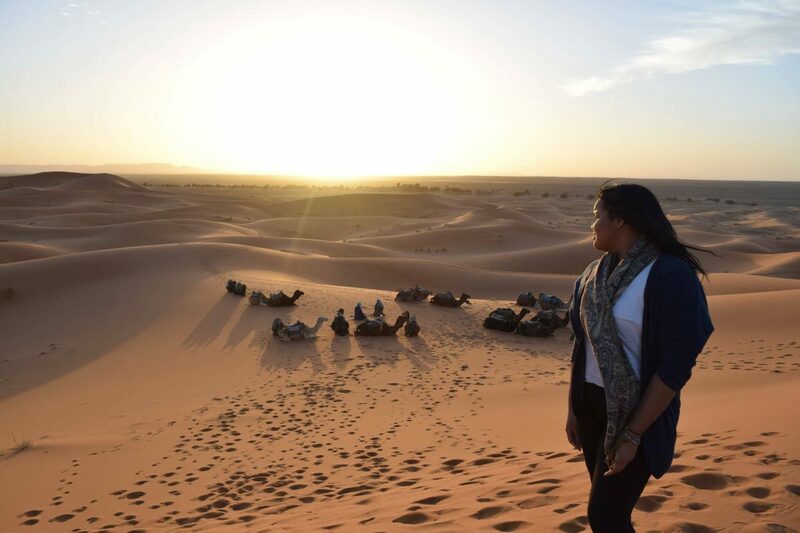 As much as I like to advocate for Morocco being more than just camels and palm trees, the highlight of that week was visiting the Sahara Desert and riding a camel. We rode our camels over large sand dunes and watched the sunset from the highest peak. It was unbelievable. The entire week was filled with surprises. Our program coordinator was also our tour guide most of the time and would constantly repeat the best was yet to come – he was right. Morocco is filled with diversity. Whether it is the people themselves, the multiple languages spoken or the political and religious differences, you are in for a whirlwind. On our excursion, we spent a night surrounded by snow-topped mountains and woke up the next day in a campsite on Saharan sand. We’d spend an afternoon lost in the busy and narrow market streets and drive through fast pace roads the next. One day we encountered women who were more traditional and conservative, and drove past women on mopeds the next day. Morocco has figured out a way to appreciate difference as it paints a beautiful picture of its country’s history. Our second excursion came weeks later, and it was a five-day stay at a village in the town of Ouazzane in northern Morocco. While it was a completely different experience from our first excursion, it was twice the reward. The family I stayed with was amazing. They made me and the other student that stayed with us feel right at home. We tried to convince our host mom to let us help her milk the cow almost every day but she never allowed us to. In her opinion, it was rude to let your guest do any work. After a lot of supplication we managed to go and herd the sheep one afternoon. We helped them cross the busy road and I was given the opportunity to lead them toward the mountain. Once at the top of the mountain the view was beautiful. We also spent an afternoon at an elementary school playing with the children, where we painted a mural for them to remember us by. Meeting the children was hands down my favorite part. They had to walk 30 minutes on a busy road to get to school everyday, but they did not complain. They were all so sweet and eager to learn. During our stay at the village, whenever we ran into the children, they would sing the ABC’s or count from 1-10 to us so that they remembered what we taught them. Leaving the village was one of the most difficult things we had done all semester. In such little time these people had found a place in our hearts, and we were certain that we would never forget them. The last month of our program is devoted to fieldwork reporting. This past weekend we moved out of our host family’s homes and into our own apartments. Following our stories to wherever they take us, while some of us branched out to other cities. As for me, I will be reporting out of Rabat for a little while longer. The next five weeks will be interesting as my two roommates and I attempt to be journalists in a foreign city with a foreign language. From Rabat, Morocco to TBA.